A couple of weeks ago, we posted about our upcoming German open day, a chance for you to learn about the German course at Oxford. 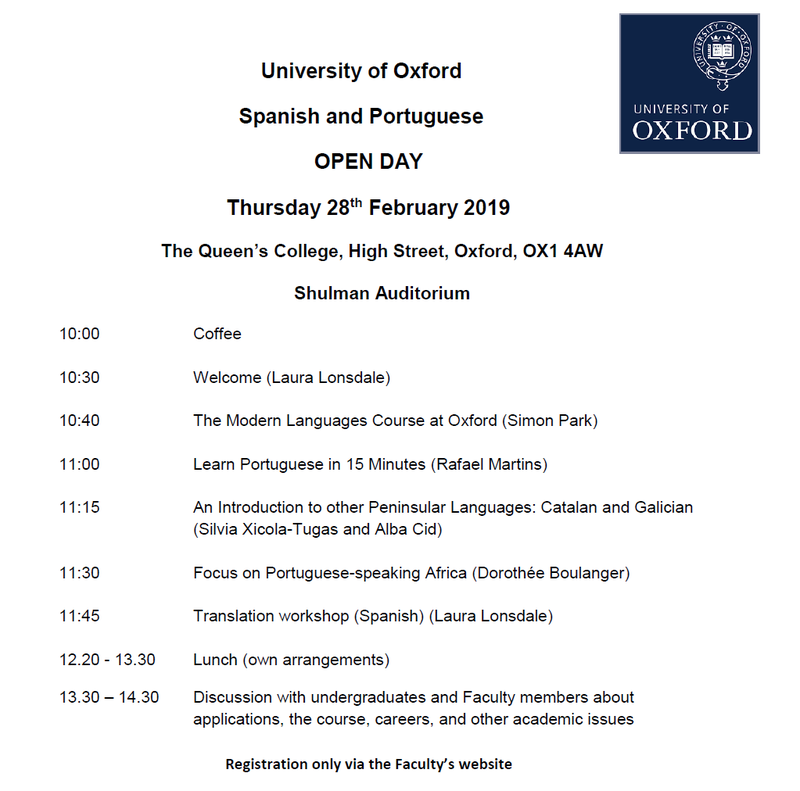 This week, we continue the theme by bringing you news of our open days in Spanish and Portuguese (Thursday 28 February at The Queen’s College), and Russian and other Slavonic Languages (Saturday 2 March at Wadham College). As with the German open day, these events are a fantastic opportunity for you to explore what an Oxford degree in those languages looks like. They offer a mixture of academic tasters so you can get a feel for the content of the degree, information about applying to Oxford, and interactions with tutors and current students, who will be happy to answer any questions you have about languages at Oxford. Highlights of the Spanish and Portuguese open day include: an introduction to Portuguese in 15 minutes, an introduction to other peninsular languages (Catalan and Galician – for more on Galician, see our post here); a spotlight on Portuguese-speaking Africa; and a Spanish Translation workshop. 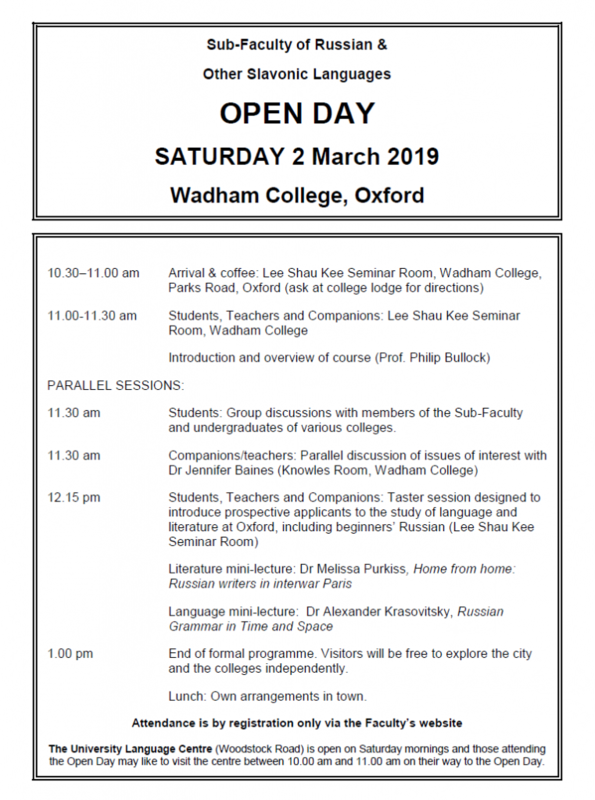 Highlights of the open day in Russian and other Slavonic Languages include: a mini lecture on ‘Home from home: Russian writers in interwar Paris’; a mini lecture on ‘Russian Grammar in Time and Space’; and a parallel discussion for parents and teachers. The open days are open to anyone in Year 12 who is interested in studying those languages at Oxford, including if you are interested in picking up the language from scratch (with the exception of Spanish, which we do not offer from scratch). Sessions will be suitable for learners who have no prior knowledge of the language, as well as those hoping to apply post-A Level. There are a limited number of places for accompanying parents and teachers. The events are free of charge but a place must be booked through the faculty’s website. Happy New Year from Adventures on the Bookshelf! To kick off the blog in 2019, we’re diving in at the deep end and bringing you news of our German open day. If you’re thinking about applying to study German as an undergraduate at Oxford, this is an excellent opportunity to meet some of the tutors, try out a couple of academic taster sessions which will give you a flavour of what it’s like to study German, and take a look around Oxford. See below for the full details and programme. If you would like to attend, please book a place via our website. What? The 2019 German Open Day, designed to showcase the Oxford German course and answer any questions you might have. Who? If you study German at school and would like to continue it at university, this is your chance to see what degree-level German is like, and how we go about teaching it. But equally, even if you do not already study German but think it could be something you’d like to pick up at university, this event is a chance for you to ask any questions about studying German from scratch, and see whether it’s for you. In short, all budding Germanists are welcome, regardless of whether you have already studied German in the past. Where? 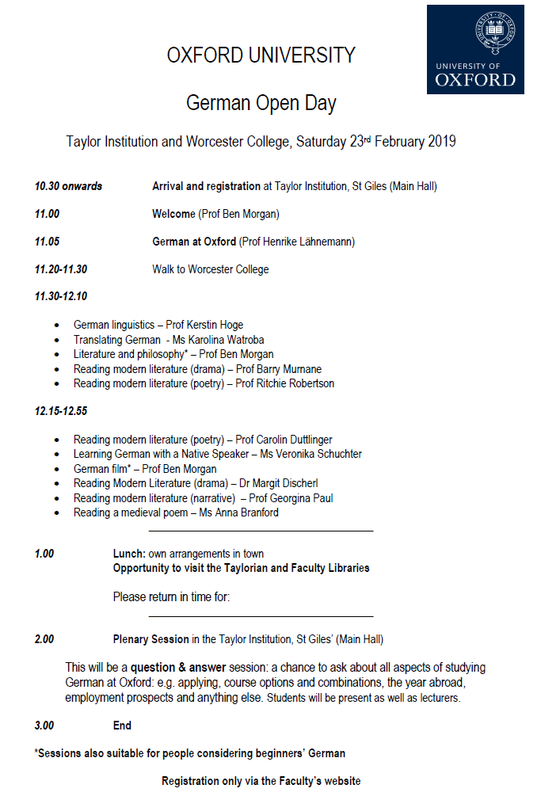 The event will start and finish at the Taylor Institution on St Giles, and the middle portion of the day will be spent at Worcester College. How? Book a place by registering on our website and signing up for the event. Keep your eyes peeled for our other open days coming up later in the term.